Historical news relevant for today. A conversation with Timothy George. How certain details of the nativity became tradition. The Reformer loved to dwell on the nativity. Here are a few of his thoughts. At the temple, long before the cross, her son’s cruel death pierced Mary. What is the rosary and how does it work? Catholics maintain that authentic devotion to Mary is praise of her Son. 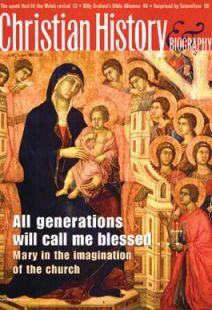 What did Mary do during the youth and ministry of her son? John seems to tap a Hebrew political tradition to show Mary in an exalted role. A few good places for Protestants to explore the church’s thought on the mother of our Lord. The day God settled the Bible question for Billy Graham. Albert Schweitzer went to Lambarene in West Africa, where he set up a hospital in the jungles along the Ogowe River.